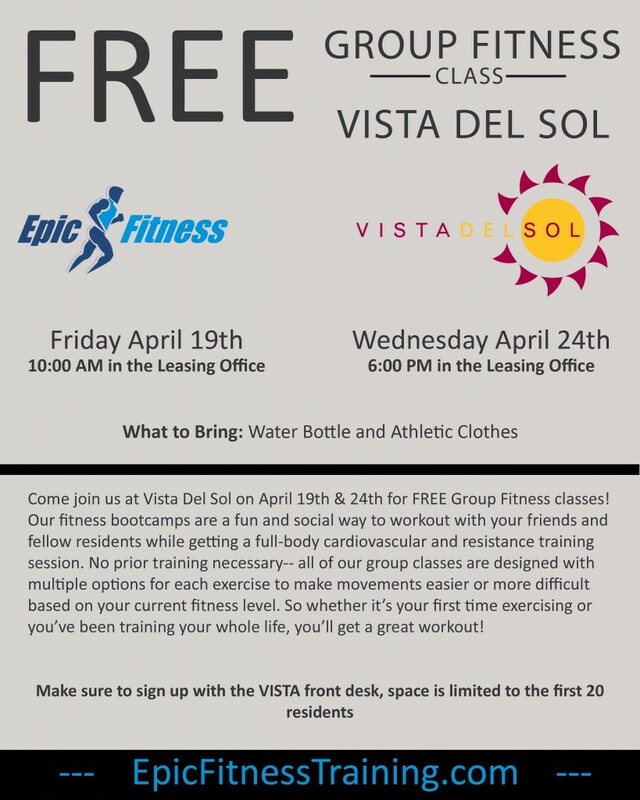 Vista Del Sol residents will have two opportunities to get a free workout this month! Start off pool season the right way by getting back into shape with an Epic Fitness at Vista Del Sol fitness bootcamp. Our group fitness classes consist of a full-body resistance and cardiovascular workout in a fun group environment. All sessions are designed to meet a broad range of fitness levels, so if you’re a beginner or a pro athlete, you’ll still get a great workout! Time: 10 am on Friday the 19th and 6 pm on Wednesday the 24th. Epic Fitness bootcamps are a fun type of outdoor (sometimes indoor) group exercise classes that mix traditional calisthenic and body weight exercises with interval training and strength training principles to leave you with a great workout in a fun social environment! All Vista residents get a free private training session and health assessment! Email us at Contact@EpicFitnessTraining.com for more information on group fitness classes, private and semi-private personal training, nutrition coaching, yoga, or pilates at Vista Del Sol.